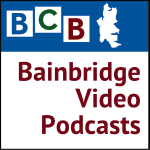 In this 5-minute video podcast, meet Terry Lande, our island’s longtime Executive Director of the Bainbridge Island Metro Park and Recreation District. Terry’s staff gave their all — and then some — to the hands-on creation of this inviting and inclusive “Owen’s Playground” at Rotary Park on Bainbridge Island. In his conversation with BCB’s Channie Peters, Terry explains that his team at the Parks District were so inspired and attracted by the idea behind Owen’s Playground that several of them worked on the project long beyond their paid hours. Virtually all of the staff of the Bainbridge Park and Recreation District provided hands-on help on the last day before the grand opening. Terry is 6th from left on 2nd row, with white goatee. 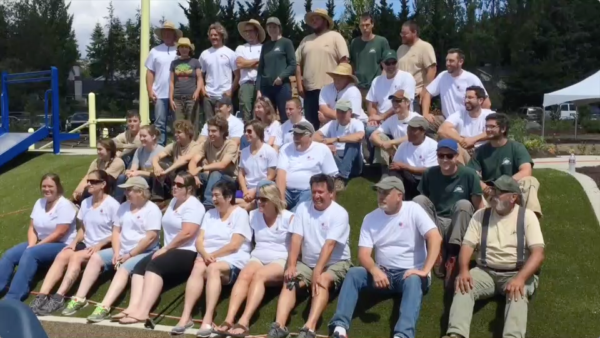 Terry invited his whole Parks District staff team to come to work at the playground on the last day before the grand opening event, correctly realizing that the hands-on experience would be a collaborative labor of love and one to be cherished. The Parks District played a key role in bringing the project to realization. The Owen’s Playground project found a home in the park thanks to a unanimous vote of the commissioners of the Bainbridge Island Metro Park and Recreation District (“Parks District”) to earmark 13,000 square feet at the existing Rotary Park (which also includes two ball fields). The project to create an inclusive park, designed to be safe and accessible for all, has been embraced by hosts of individuals and organizations who made the creation of this remarkable play space a true labor of love. Design was donated by Studio Hanson|Roberts, with the laborious hands-on management and construction work — and the creation and assembly of the playground’s artistic features — coming from Terry’s Park and Rec District team, including, for example, manager Dan Hamlin and team leader David Harry. Credits: BCB videographer and video post-production: John McKenzie; BCB host: Channie Peters; BCB social media publisher: Barry Peters.